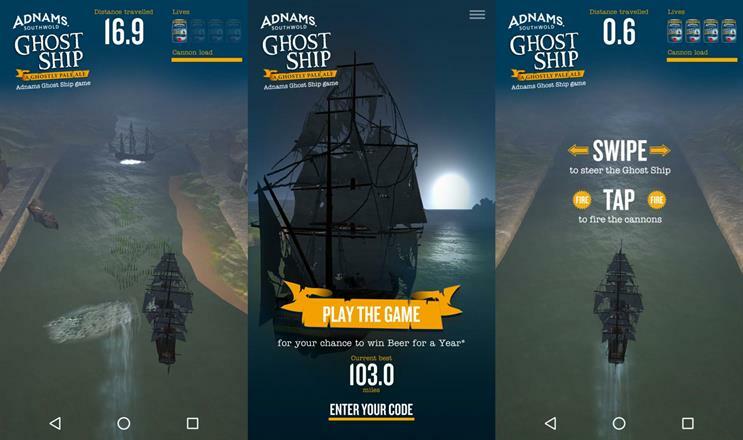 Suffolk brewery Adnams has launched a mobile game for Android and iOS to market its best-selling beer, Ghost Ship. Created by Norwich-based Immersive VR, the game is involves steering a ghostly sailboat through an obstacle course and defeating enemies along the way. Players are able to submit their high score, and those that finish in the the top 20 of the game’s leaderboard will win a year’s supply of the beer. The brand is also including codes on bottles and packs that can be entered in the app for a chance to win a weekend visit to Adnams Brewers House, along with other prizes. Ghost Ship was launched as a limited edition beer for Halloween in 2010, became a permanent line in 2012, and is now Adnams’ most popular beer. In 2014 it was named the UK’s best independent canned beer, at the Indie Beer Can Festival, supported by the Society of Independent Brewers. Emma Hibbert, marketing director at Adnams, said: "The Ghost Ship game is a really fun way for us to engage with Adnams fans and reach out to those new to the brand." "Innovation is at the heart of everything we do, from product development to sales and marketing to our HR practices, therefore it is important for us to give customers fun and innovative ways to access the Adnams brand."